Carved in 44 hectares of picturesque oceanfront, Okada Manila the most iconic integrated resort in all of the Philippines, and arguably in all of Southeast Asia. The resort features all the luxurious comforts of a one-of-a-kind, masterfully created space for five-star pleasure and leisure. #1 - Luxurious guest rooms: Upon arrival, guests will immediately feel an empowering sense of privilege. The resort features 993 luxury suites and villas in two Y-shaped hotel wings, each gorgeously furnished with world-class amenities, state-of-the-art technology, and spectacular views of the Manila Bay or The Fountain. #2 - Spectacular water front views: The resort sits right in front of the Manila Bay, giving guests an amazing view of the city's most popular water front. The bay can be seen from many guest rooms, from the lobby area, and from many of the restaurants. #3 - Diverse dining options: With over 21 dining options, Okada Manila provides non-stop thrills to excite the palate. Cooking up unforgettable moments, their roster of Michelin-starred chefs’ offerings range from fine dining to comfortably casual, and everything in between, serving traditional classics alongside innovative culinary creations. The array of flavors is as delightfully eclectic as the world’s cultures - from zesty Asian fare to the flavorful offerings of European cuisine. 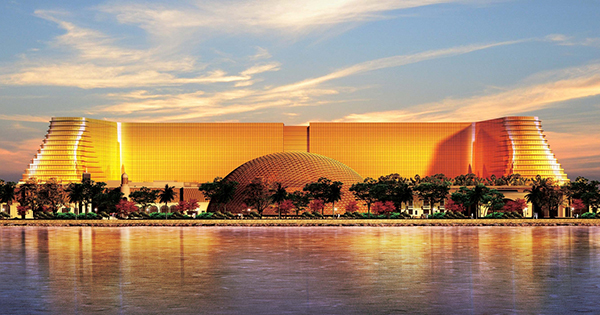 #4 - World class entertainment: As an integrated resort, Okada Manila is all about providing cutting-edge entertainment worthy of its world-class stature. The in-house entertainment group at Okada Manila consists of about 40 international artists, as well as creative designers, all working under the leadership and vision of Creative Director and Choreographer Giulio Scatola. #5 - A grandeur water fountain show like no other: Equipped with advanced underwater robots, more than two-thousand lights, dozens of high-fidelity speakers, and more than 700 high-power jets, the Fountain at Okada Manila is a sight to behold! As expansive as 50 Olympic-size swimming pools, the fountain’s grandeur and accurately choreographed water, light and music performances rival those in Dubai’s Burj Khalifa and Las Vegas’ Bellagio.